Most of us homesteading types dream of being energy independent and installing solar power. My husband and I purchased 28 solar panels for our home and had them professionally installed. We definitely had some lessons learned as well as good experiences. Here’s what you need to before installing solar panels on your home. While you can install your own solar panels, my husband and I did not feel like we had the knowledge to do this ourselves, or the time to dedicate to learning how to do so. We had contacts with a local solar company, so we had them come out for a quote. If you think you may want to install your own solar panels, I suggest you check out Homestead Honey’s Creating Your Off-Grid Homestead E-book. They have installed their own DIY system of solar panels. Homestead Honey discusses the details of their solar system (along with details on their other essential systems like water). Any time you pay someone to do a large project for you, it’s a good idea to do your homework. Call several businesses, tell them that you’re collecting quotes and describe what you’re looking for. Have at least three come out to your house, look at your project and chat face to face. It’s true that it stinks to have to tell someone you aren’t interested in working with them after they’ve put time into putting together a quote for you. However, every time we have met face to face with people in situations like this we have been very clear on who is the best to work with. Oftentimes the cheapest company is NOT the best choice for you. It’s sometimes hard to know for sure without going through the quote process. And while the hard data is super important, you also want to listen to the vibes that you feel when working with individuals. Don’t discount your intuition as an additional source of information. Also, collecting a couple quotes helps you to know what a fair price is for what you’re asking. This puts you in a safer position when making large financial decisions. When you contact a solar company, they will most likely pull up your property on Google maps and look at what direction your buildings are facing. Another thing to consider is what kind of sunlight you are likely to get on your property. Large trees or buildings can block the amount of sun that your property receives. South facing produces the most electricity. Even if you don’t have a south facing roof you may still be able to install panels. Eight of our panels are on an east facing roof. There are also structures that can be installed on your roof that will raise the panels to face south, or even track the sun. And if you don’t have a roof in the right spot with the right amount of sun, you may even be able to install a ground array instead. Here’s an interesting bit of information: In Germany, some people are now recommending that solar panels be installed facing west. The country has such a high rate of solar that their grid system is maxed out during the mid-day when the sun is highest. However, much of the demand for energy occurs later in the day as the sun is setting. While west-facing panels don’t produce to their full capacity, they do produce at a different time of day, which helps smooths out the peaks and valleys for the country’s overall use. Now, this may not make financial sense for you personally, but if you are interested in going completely off grid instead of grid tied it may be useful to consider. Just in case you’re not already aware, here is what off grid and grid tied mean: off grid means you are not connected to your city’s electricity at all, and you only use what you produce yourself. This is more common in rural locations. Grid tied means you have your own solar panels that generate electricity. Whatever you don’t use flows back to the city during the day. Then at night instead of using expensive batteries, you pull city electricity to power your home. Batteries can be expensive, but the nice thing about being off grid is that you don’t have outages when everyone else does. Being grid tied means when the electricity goes down, so will your house. If you are grid tied, you may also receive a credit on your electric bill for the energy you produce. Some states pay more generously than others. Here in Texas we pay the commercial rate for any electricity we use, but they buy back any we produce at below the wholesale rate. Before you install solar panels you’ll need to understand what your typical energy use looks like. Your electric and gas bills should have this information on them. It’s a good idea to look at a full year’s worth so you can see how your energy use fluctuates throughout the year. Electricity is measured in watts. We all know 60 watt bulbs, right? If you run a 60 watt light bulb for one hour, it will have used 60 watt-hours of electricity. The unit of measurement you will see on your bill is kilowatt-hours, (kWh). One kWh is the equivalent of 1,000 watts per hour. (That’s like running almost 17 light bulbs for an hour). If you go with a solar company they will most likely do all these calculations for you, but if you install your own panels you’ll need to know how many kWh each panel will produce to find out how many panels you need. (Homestead Honey’s ebook can give you an idea of what it’s like to DIY). The other factor in deciding how many panels is how much roof space you have available. You may have a large roof, but you’ll want to look at obstacles such as vents or chimneys, as well as shade from nearby trees or buildings. We use a lot of electricity for our homeschooling family of seven, (with two home based businesses), so we installed 28 panels that should produce about 14,000 kWh per year. This takes up all of our south facing roof, as well as some of the east facing portion of our patio. Once you have an installer you want to go with, and you have an idea of what kind of system you will be able to get, it’s time to look into the nitty gritty details of your contract. Don’t be afraid to ask questions! This is a big investment and you don’t want to be caught by surprise by something that you could have found out ahead of time. You should get a breakdown of the costs and what you are getting for your money. Look at the numbers provided, such as the discounts and incentives, as well as the buy-back information from your utility company. Also, be aware that those numbers can change potentially! Review the warranty information in your contract and make sure you understand what is covered and what is not. Will the solar company remove the panels if you need to replace your roof? Who is responsible if there are any damages? Do you need to make any adjustments to your home insurance? Very rarely do people regret knowing too much about large purchases. Usually it’s the other way around, so read all the fine print! Once you have all the nitty gritty details it’s time to figure out if solar panels make financial sense for your particular situation. You’ll need to know how much energy costs in your area to find out how long it will take you to break even on your system. How much does your system cost, and how much can you sell extra energy you produce? Once you have all those details, you’ll be able to find out how long it will take before you can recoup the cost of installing solar. Don’t forget to take into account any rebates or tax discounts you may qualify for. If you are financing your panels, make sure you calculate the total cost of interest over the life of your loan and add that into your costs too. A popular way to make getting solar panels more achievable is through various contracts. These can vary. Some are simple loans for the amount of the solar panels. Others are more complicated and may stay with the house for years, even if you’ve moved. Other times the energy company owns the panels and you provide your roof space for a rebate on your bill. If you decide to do anything other than cash for your panels, be a wise consumer. Read all of your contracts and don’t stop asking questions until you understand all the terms. Very rarely does paying interest turn out to save you money in the end. It definitely helps to take time to do the math and find out what your total cost will be including all your interest payments. Only you know your personal situation and if you have the discipline to pay off something quickly. I always recommend NOT carrying debt, and if you do, to pay it down as quickly as possible. Also double check that there are no prepayment penalties. Many times these types of loans can get a small payment per month because the length of the loan is almost as long as entire mortgage! While these can be transferred to new owners, you may be limiting your prospective buyers if you chose to go this route. Another important calculation you will need to make is how much you can sell back the energy you create. And if you are planning to sell electricity back to your electric company, please be aware that they can change their terms in the future. Arizona is currently undergoing a change in their solar rates. Previously they used to buy back electricity produced at the same rate you would pay to buy the equivalent kilowatt hours. Going forward they will pay for energy produced at the wholesale price, which is much lower. This is the situation for us, and why we are not installing a system that produces 100% of our electricity use. We have higher use rates in the summer than during the other nine months of the year. We would be paying for more panels than we use most of the year, but not able to sell back that electricity at a rate that would pay for the cost of the panels. Of course if you can afford it, and your goal is to be completely energy independent, this may not matter for you. However, if your state currently offers a generous net metering amount, count yourself lucky and be aware it may change in the future. One the flip side, if your electric company raises their rates, your solar panels will pay for themselves all that much sooner! Once you’ve gone through all the contracts, numbers, and details with a fine tooth comb, the real fun starts! You’ve decided solar panels make sense for you and you’re going to move ahead with the work. Wohoo! So exciting! The first thing that has to happen is your contract will need to get all the necessary permits and order your equipment. It’s kind of a bummer waiting for this part because you’re so excited to get going, but paperwork can be slow sometimes. Once your panels are delivered, they’ll come out and prep the panels, and install them onto your roof. Once the panels are mounted on the roof, an electrician will need to come out and hook the solar panels up to your house and your meter. This will require turning off the electricity to your whole house for a few hours. You may also have a second meter installed that will track the energy produced, while the meter from the city will track the electricity you are using. All this equipment, plus an inverter (and batteries if you’re using them) will need to be installed near to your current meter, and there are particular rules about how far apart things need to be. Unfortunately for us, not everything went perfectly with this experience of installing solar. 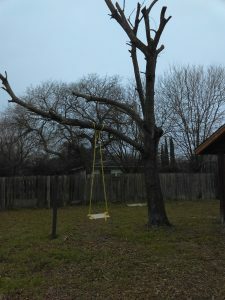 As part of the contract, we agreed to let our solar company trim back the tiny bit of the tree that was hanging over the patio where eight of our panels are located. They hired a subcontractor to do this. Here’s were I feel so sad. It hurts just to think about, and I hate writing it out. This subcontractor topped our entire tree. Without permission. I feel sick every time I think of it. You know those “if only” moments? This is one of mine. The trimmers didn’t give us advance warning of when they were coming and I was running out the door to an appointment when they showed up. If I had to choose between keeping that tree and getting solar panels, I would have chosen the tree hands down, every time. Never EVER let leave people working at your house unsupervised. Just don’t. Tell them they have to come back. Cancel your appointment. Just don’t do it! I’ve learned my lesson the hard way. Don’t let it happen to you! Waiting might be the hardest part! Once everything is all hooked up, you’ll most likely need to wait again. The system will need to be inspected before you can turn it off. Everything must be up to code, and they will also check to make sure that your system stops sending power back into the grid in the event of a shut down. If you want your electricity to work even when the grid is down, you will need to be off grid. Otherwise it’s too much of a safety hazard! Once you have the green light from the inspection, you now have solar power! Sweet! Super exciting, awesome, and fun. Our solar panels hook up to a nifty app called Solar Edge that we can access on our phones to see how many kilowatts we generate each day. I was actually quite surprised at how much the energy we produce fluctuates each day based on the weather, and it’s really nice to see comparisons between weeks and months. Life with solar panels should be pretty much the same as life before. Only way cooler. And ethical. Not to mention energy efficient. And hopefully cheaper! We have certainly appreciated the reduction in our bill and are currently producing 100 percent of our electricity. 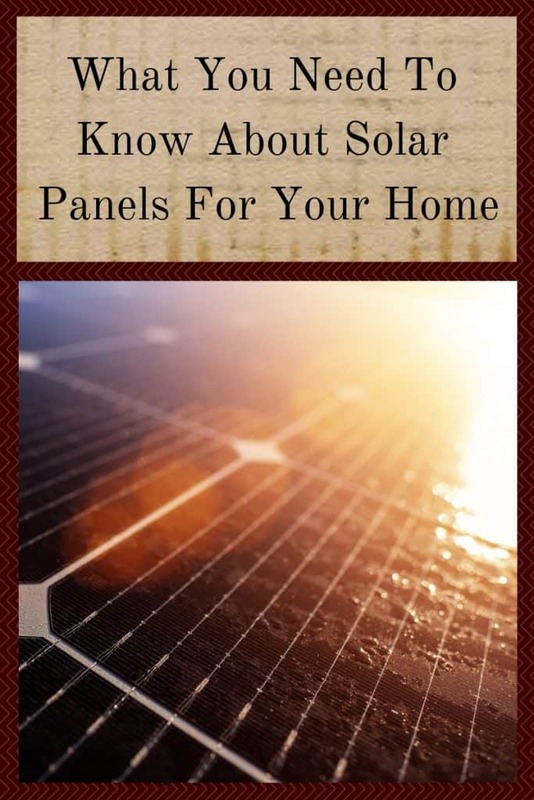 I expect that will change a bit over our hot summers, however, there are some things you can do to use your own solar power more effectively. The easiest thing to do is to run your larger appliances such as dishwashers, washing machines, and dryers during your peak production hours when the sun is shining. Especially if your electricity charges extra for peak hour use, you’ll want to pre-plan when you use your big energy hogs. Another thing you can do to keep costs down is to hang dry your laundry when it’s time to turn on your air conditioner. I did not do that last summer because I was very pregnant. However, if I was committed to only using our own power, it would be very achievable. You could also install a wood burning stove instead of electric heat. This is an especially good idea if you don’t produce much in the winter season. I love our solar panels, and I love that we are utilizing all that previously wasted sunshine! It still seems surreal to have solar panels after talking about getting them for over ten years! Sometimes I’ll stand and watch the meter run backwards because I’m a dork like that. It’s pretty awesome! Hopefully solar panels are a worthwhile investment for you, and we can all work together to increase the amount of energy we produce ourselves. There are lots of great reasons to install solar panels, and by making an informed decision you can decide is solar is right for you.